After finally gathering the materials and finding some time when my friend was available to assist, I set to building a platform upon which to build my cockpit. 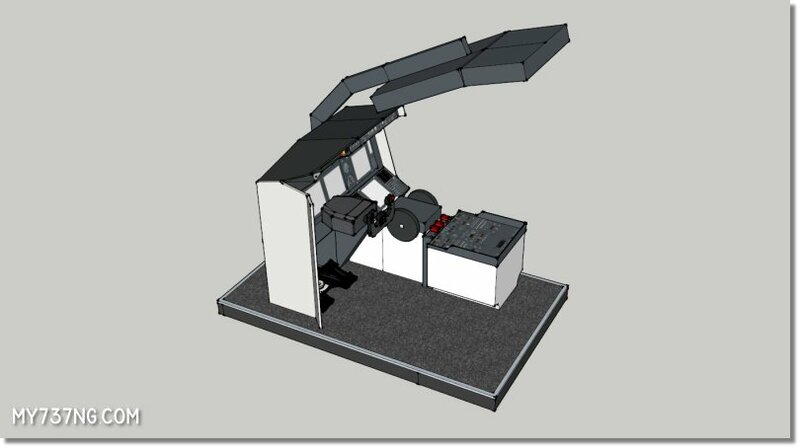 A few months ago, I designed the base using SketchUp. In that post, I had to guess at many measurements from photos and data sheets I found online. Now that I have actually received the major components, it was time to see how close I was. Surprisingly, it all matched up almost perfectly. The only change I made was to lengthen the base another 6 inches to make sure I had plenty of room for the pilot’s seat and to clear both overhead panels. 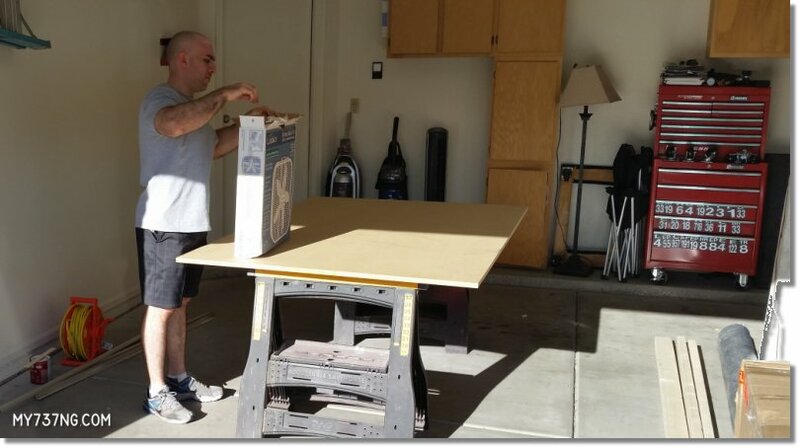 It all started with a 4′ x 6.5′ sheet of 5/8″ MDF. Here, my friend is setting up a box fan as it was about 109F outside! Just getting started in the Arizona heat. 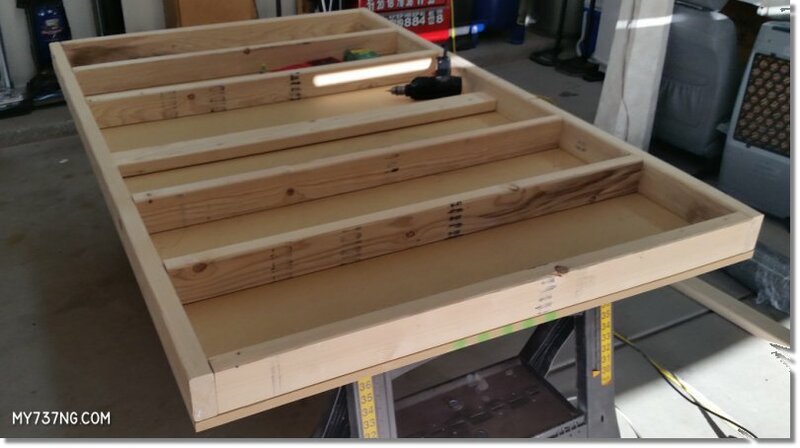 Underneath, we mounted vertical 2×4 studs to the base for structural support and rigidity. Edges and cross members in place underneath the cockpit base. 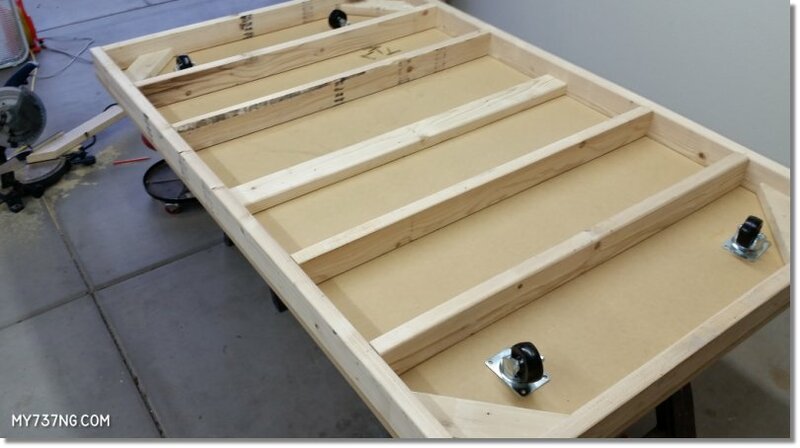 Horizontal 2×4 studs were used for corner reinforcement and to provide a place to attach the six 3″ hard rubber casters. 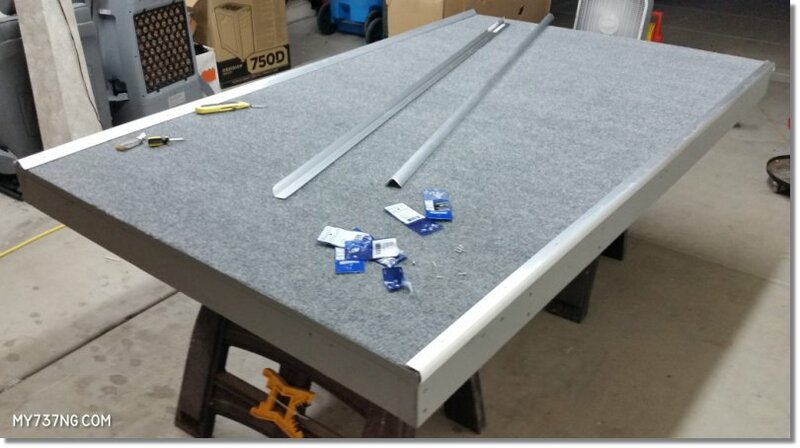 Getting ready to install the wheels under my cockpit platform base. 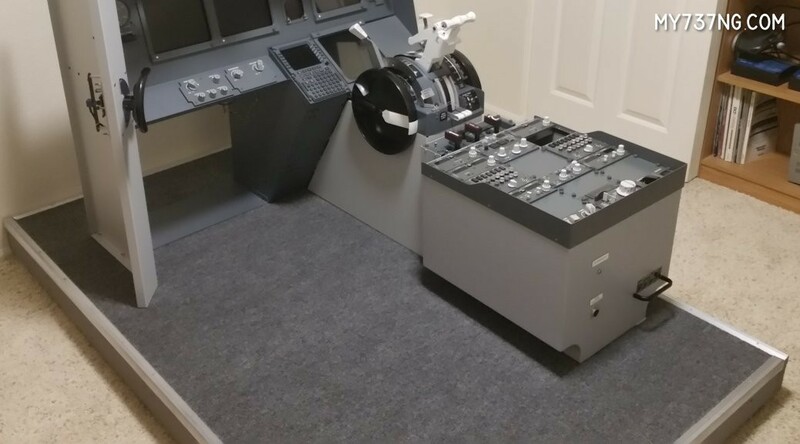 Finally, we painted it in RAL 7011 Boeing Grey paint, covered the top with matching industrial grade carpet, and added aluminium stair edge trim around the edges. Adding carpet, paint, and edging to make the cockpit base nice on the eyes and feet. It is extremely strong and rigid, and each caster is rated for 175 lbs. This gives me the ability to move it about the small room when I need access to certain areas. And that has already come in handy numerous times. In the main picture, you can see how much room the JetMax SKTQ, Throttle Quadrant, and CPFlight Pedestal take up on the new platform. They are not fastened down yet, as I need to fit the computers on the platform behind the MIP, make sure the JetMax overhead support bracket has clearance, and mount the Saitek Yoke and pedals. 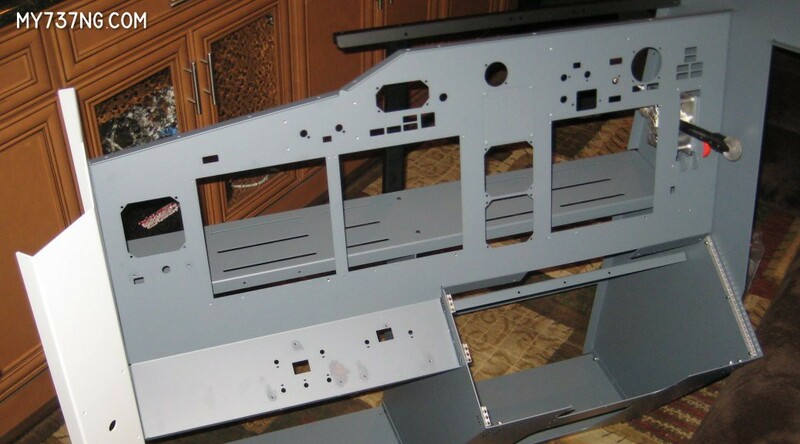 Ah yes, I have started to assemble the FDS Jetmax SKTQ Single-Seater cockpit. I will write up a full page article on it soon, but in short, it is pretty damn nice. It is well made, but obviously not as exacting or detailed as the $100,000 cockpits can provide. It did have quite the adventure while being shipped via DHL which caused some damage and missing bits, but FDS-Jetmax were more than helpful in getting it all straightened out. The following are a few pictures showing a bit more progress over the next 3-4 days. 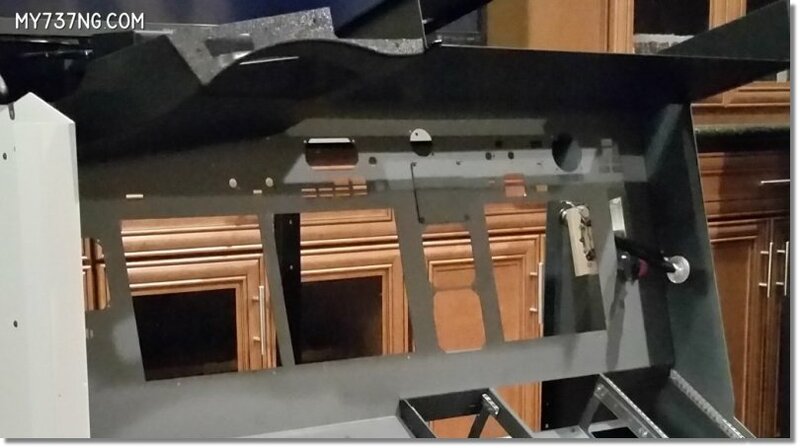 First up, the glareshield supports are in place. Quick cell phone picture of the MIP as the glareshield was being added. Next up, the bezels, pots, switches, gauges, AFDS, annunicators, tiller, and engraved panels are getting into place and the wiring has begun. 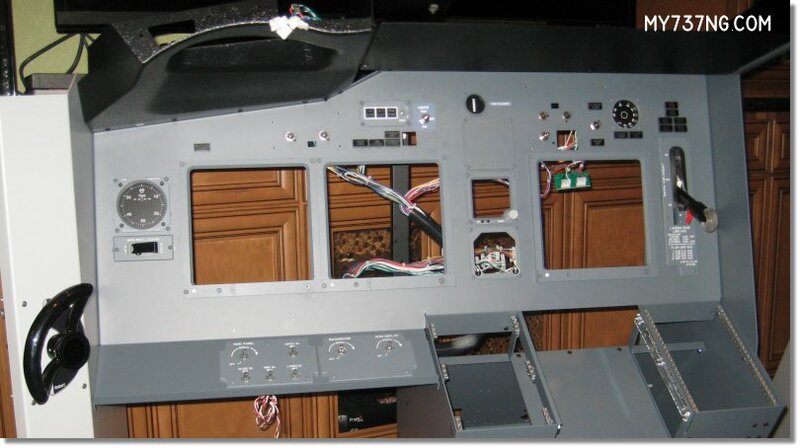 Electronics and wiring going into my JetMax SKTQ. 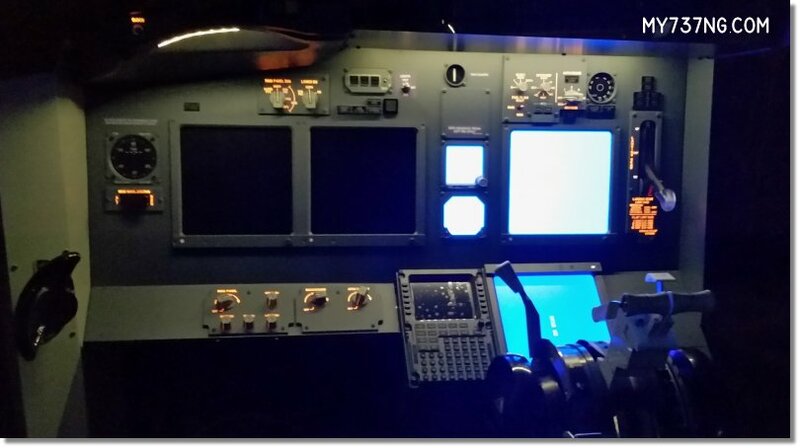 Next up, the monitors got mounted, the knobs are all in place, the CDU and throttle quadrant are settled in. Time for some power and lighting tests. It should be noted in the image below, the panel backlighting is custom and is not included in the normal JetMax product. I have since completed the JetMax and wrote a lengthy review up on it. Check it out if you are interested!